According to our friends at Gatorland each monster style vehicle has a unique name and a back story to match! BONECRUSHER℠: Billed as the largest American Crocodile in captivity, Bonecrusher℠ was a big draw at Gatorland in the 1950s and ’60s. Gatorland founder, Owen Godwin, Sr., offered a $1,000 reward to anyone who could find a larger American Crocodile, and bring him to Gatorland. As you can guess, no one has ever been able to claim that prize. Ol’ Bonecrusher℠ passed away in 1971 with his title intact. His legacy, however, lives on with his son, Bonecrusher II, who lives in the south section of the park. 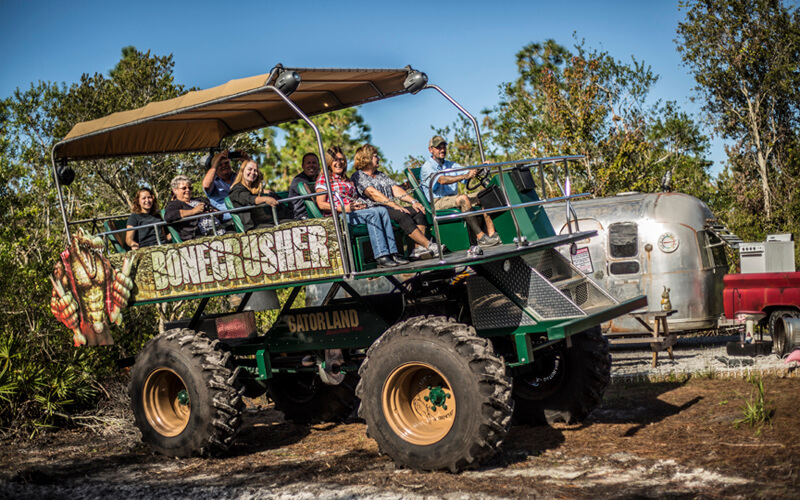 The heritage of Bonecrusher℠ runs long and deep at Gatorland, and we celebrate this legend with his massive, 4-wheeled namesake, which rolls out each day as part of Gatorland’s Stompin’ Gator Off-Road Adventure! CANNIBAL JAKE: In the 1950’s, Gatorland was a roadside attraction that thrived during the winter tourist season. In the hot summers when tourism was non-existent, Owen Godwin, would load Cannibal Jake into a custom trailer, and tour him up and down the east coast, charging spectators a whole nickel for a look at this massive Florida alligator. Folks up north loved to take a gander at Ol’ Cannibal Jake, and those nickels just kept pouring in, giving the family enough income to survive the long summers and keep the park running until busy season returned! You can feel the spirit of Cannibal Jake in this rough riding, mudslinging marvel of redneck engineering that shares his name and can only be found at the Stompin’ Gator Off-Road Adventure! SWAMP GHOST℠: Born in Louisiana back in 1987, our Leucisitic White Alligators are among some of the rarest animals in the world, and Gatorland boasts the largest collection of them anywhere! Back in the Bayou, the white skin and piercing blue eyes of these incredible animals have inspired many backwater legends. In fact, Cajun folklore says good fortune will come to those lucky enough to stare into the blue eyes of the mystical white alligators. 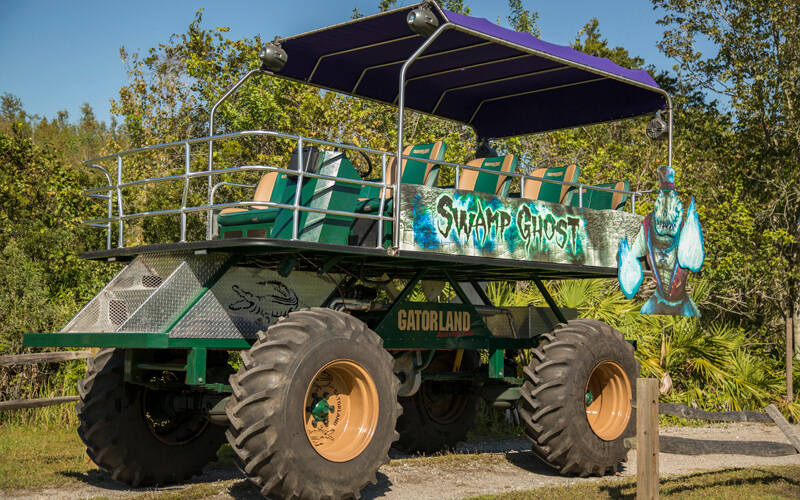 Now, the power of these magical creatures has been bestowed upon “Swamp Ghost℠,” one of Gatorland’s monstrous swamp buggies that prowls the wild backroads of Gatorland’s Stompin’ Gator Off-Road Adventure.